I HAVE TO ADMIT that it's tempting to not blog while on break. But it's part of the experience, and since I've agreed to write about "all things graduate school", I would be remiss if I left out the down time. So, it's weird being off. I find myself creating structure. When I received two electronic syllabi today, it felt sort of good to organize a few things for spring classes. Yep, I ordered two books, collected my texts that we will be using again, and previewed some of the first assignments. WHAT IS WRONG WITH ME? Let's just call it a "school relapse." * Decorating our home for Christmas. * Baking sugar cookies, decorating them, and eating them. * Reading fiction and watching movies. * Meeting friends for luxuriously long coffee conversations. * Hanging out with my husband. * Going to (and hosting) holiday dinners and parties. My life has been so structured for so long, and this is the first long break I've had where: a.) I am not working, and b.) I am not traveling home to see my family (which has inherent stressors of its own). I hesitate to admit that I am struggling a little bit with the freedom. Don't get me wrong: I don't want it to end. A professor told us last semester that after graduation we'd have to adjust to our new lifestyles, and I guess this long break is a glimpse into my not-too-distant future (minus a job, of course). I recently had a surge of joy when I realized I could watch TV or write Christmas letters without niggling thoughts of homework and reading assignments. Now that's a really strange, yet wonderful feeling. I'm guessing that about the time I settle in to this break, it'll be time to pack the book bag for our final semester (wow; final semester has a delicious ring to it). For now, I'll do my best to chill out and enjoy this rare recess from school, this holiday gift, called winter break. Its so true! I had a lingering feeling that I still had an assignment due for about 6months after graduation! LOL - enjoy these long breaks while you still get them! Take care and enjoy the break - you've earned it! Friday is my last assignment (Ethics in Social Work Presentation) for the semester. 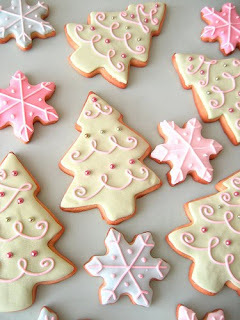 I am so looking forward to making some sugar cookies too. I have a long list of people to see and fun things to do. So glad you are enjoying your break! Thanks SocialWkr24/7! Do you ever have grad school dreams (nightmares)? I still occasionally dream about my undergrad math class. I can see the building and the room and everything! And I'm not ready for the exam! Enjoy your break, and your cookies! I am loving my winter break as well. The sugar cookies were lots of fun. One of my daughters helped. Good memories. Back to School Jan. 12th.